south coast of New Zealand. I have been living permanently in the Heads are for about 5 years with my whanau, gifting us all with wonderful coastal living. I am motivated and inspired by nature. I love choosing a rock and an idea and seeing how I can fuse the two. curves is essential to my work. 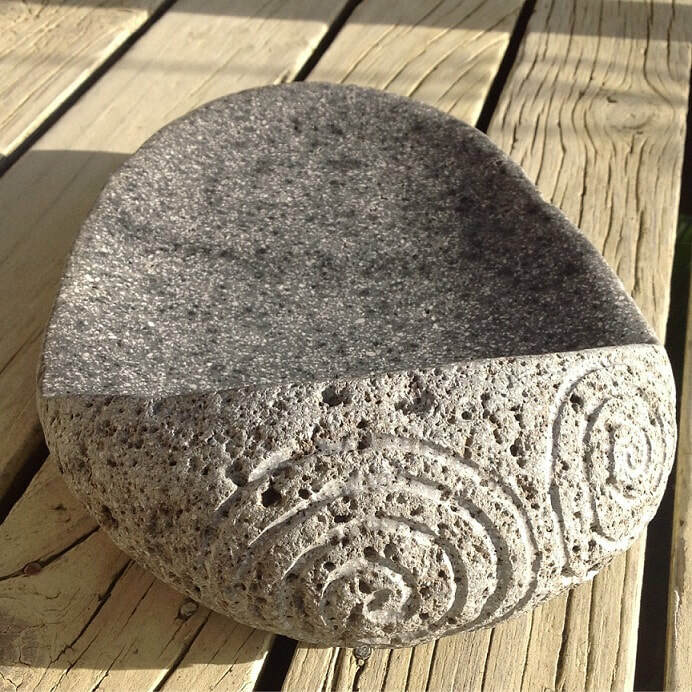 As a self-taught artist, I began experimenting with stone about nine years ago. I created my first mortar and pestle out of necessity, when we lived on an island off the coast of the Coromandel. Many years later, (about four years ago) after making a mortar and pestle as an engagement present for some relatives and after much encouragement, I created my business, Homeground. I then had something to do while the baby was sleeping. So far, I have been focused on making mortar and pestles, plates and bowls of various sizes and a couple of more sculptural pieces. As my skills have developed,I have been able to lead my work in a new direction, creating my own style over the past six months. I am excited for the upcoming year as to what I am going to create.